"Quite frankly, statewide races in the past have been very complacent about consistently having a program in those Latino communities," said state Sen. Leticia Van de Putte, the Democrats' nominee for lieutenant governor. "We haven't had a race in two decades that has put resources into Latino communities. I am so proud of the strides we have made, but I wish there was so much more." How quickly Ms. Van de Putte discards the tens of millions that Tony Sanchez put into Latino turnout. Tony Sanchez spent $76 million (over $100 million in 2014 dollars) in 2002. For months, you couldn't go through the east side of Houston without hearing a sound truck blaring messages in Spanish and English. Bill White didn't spend nearly as much, but I recall some Spanish ads that got some heavy airplay from very early in the campaign. Also, wasn't the whole point of Battleground Texas to consistently have a program to sell liberalism in Latino communities? [Aside from being an enrichment program for Obama's campaign staffers.] Perhaps Texas Latinos just don't like the shoddy liberal product that Texas Democrats keep trying to sell them. Wendy Davis must be a Karl Rove plant. 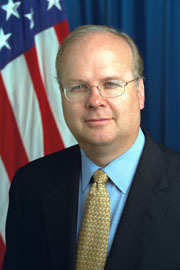 Remember those days circa 2003-2005 when the left and the Beltway media establishment (but I repeat myself) credited Karl Rove with extraordinary powers? To hear them tell it, he was playing in a league of his own. Every time something bad happened to Dems, lefty bloggers immediately assumed that Karl Rove orchestrated it. Wendy Davis's candidacy has been such a disaster for Texas Democrats that you wouldn't blame them if they started to come up with crazy theories like they did a decade ago. 1. Wendy Davis has sucked money out of competitive districts. I'm sure that Steve Mostyn was going to write a few eight figure checks anyway, but there's no doubt that some money that could have gone to competitive races instead came to Texas to fund Obama's fantasy about turning Texas blue. Plus, in her best chance to make an impression on Texas after a series of disjointed ads, we got the Wendy Davis Meltdown. Such churlishness in a debate recalled a certain Al Gore. Remember: it's all Karl's plan. 2. Wendy Davis is the worst possible candidate imaginable to win Latino swing votes. A white liberal who got rich off of her elected office while gaining liberal notoriety as an abortion absolutist? This could only be the work of the Karl Rove that DailyKos bloggers imagined. No doubt Davis will still get most of the Latinos who strongly identify as Democrats. But she certainly won't drive turnout from disaffected Democrats. Her primary loss in South Texas counties was historic. She couldn't even get Latinos to vote for her over a no-name in the primary. In Hidalgo County -- 91% Latino -- Democrats are actually removing her from their advertisements for the Democratic slate! 3. The wheelchair ad sucked all the oxygen out of the room. You know who is angriest about the wheelchair ad? It should be Leticia Van de Putte, because it suffocated any potential chance she had of getting traction. Wendy Davis was already a lost cause, but perhaps with a stroke of genius, Van de Putte could've found the right combination to narrow the race to single digits. Van de Putte is actually pretty good in front of the camera , when she isn't shamelessly pandering. With the right stroke of luck, maybe she could've grown an inkling of a chance into actual momentum. Nope. Wendy Davis killed that. Or perhaps it was Karl. Nancy Sims has a couple of interesting posts up previewing the upcoming Houston mayoral race. They seem pretty accurate to me. Ben Hall ran against Parker last election and is said to be considering another bite at the apple. We hope he hires different political professionals as he had one of the worst campaigns ever in 2013. He can finance the race though and would still be a contender if he decides to run. John Weaver and Mark Sanders destroyed Ben Hall's chances to be mayor. It was so obvious that I predicted it beforehand. Hall went from main challenger to also-ran for this election cycle. When you hire a terrible consultant, not only do you waste tens of thousands of dollars, but you ruin your chance to run again. The market for political consultants is terribly inefficient. First time candidates frequently have no expertise, and thus hire consultants who talk a big game but are terrible at campaigns. Response rates to traditional telephone polls keep declining, and opt-in online polls are an inherently biased version of sampling public opinion. His goal is to quicken the pace of culling answers and broaden the range of questions. For example, in a series of daily polls of users on Microsoft’s XBox video game console, Rothschild was able to generate forecasts and models using the data and demographic information that closely mirrored the accuracy of poll aggregation. At least if it proves successful, then I won't get my Twitter feed crowded with the "predictions" of someone who averages polls and then runs a Monte Carlo sim on top? The Texas Lyceum poll just took a poll. It included a trial ballot for governor. See screenshot below. 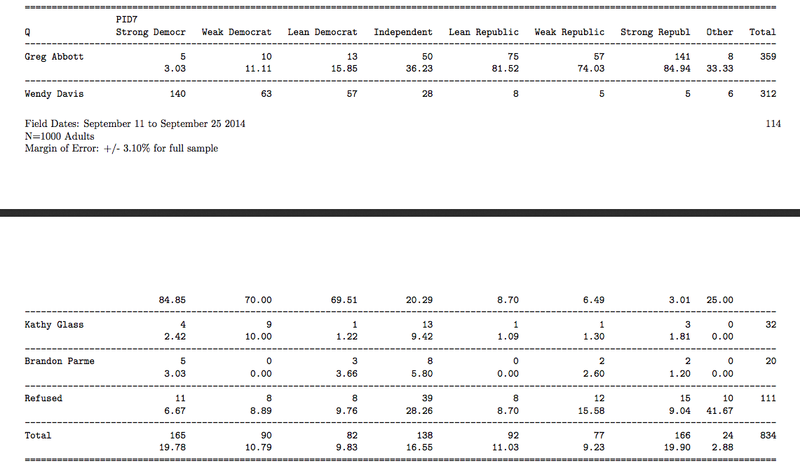 Notice that their poll sampled more Democrats than Republicans. Perhaps they thought they were polling in California or in Wendy Davis's native Rhode Island?